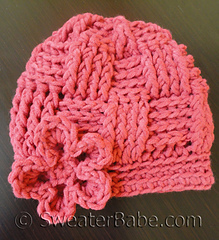 Fun, funky, chunky, bold, and warm -- all come together in this richly textured hat sized for babies and adults! 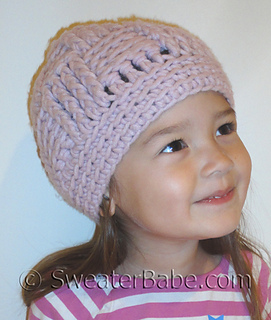 This hat is crocheted in the round using a fat hook and bulky yarn. 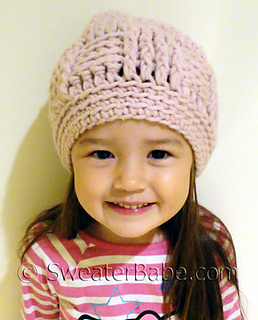 It’s a great, quick crochet project and lots darling on a baby or handsome on an adult. 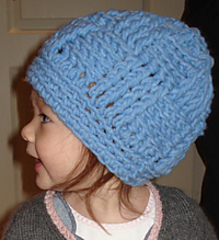 Unisex styling, so just choose their favorite color and start crocheting! This crochet project is ideal for the advanced beginner crocheter. It includes full-color photos of the techniques needed to create the nice basketweave stitch pattern. The matching pull-through scarf (adult size only) crochet pattern is available as well. And here’s a blog post on how to crochet the flower that I added to the red version to make it extra-girly!